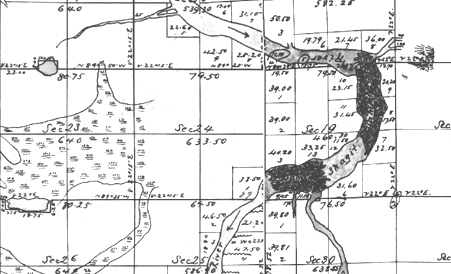 The General Land Office (GLO) mapped the Puget Lowland between about 1850 and 1890 as part of their cadastral survey of the United States and its territories for the Public Land Survey System that began soon after the Revolutionary War. Because the survey in the Puget Sound area was prior to, or in the earliest stages of, Euro-American settlement, the plat maps and field notes capture conditions prior to widespread land use change. Detail from plat maps T. 34N. R. 3E. & T. 34N. R. 4E, surveyed in 1872, showing the Skagit River near the present-day location of Mount Vernon. A large logjam is in the river and wetlands are to river right. While navigable rivers such as the Skagit River were surveyed (“meandered”), other features, such as the wetlands shown here, were surveyed along section lines and sketched within the interior of sections. Atwood, K. 2008. Chaining Oregon. McDonald and Woodward Publishing Company, Granville, OH. 264 p.
Collins, B. D., D. R. Montgomery, and A. J. Sheikh. 2003. Reconstructing the historical riverine landscape of the Puget Lowland. In: D. R. Montgomery, S. M. Bolton, D. B. Booth, and L. Wall, eds.Restoration of Puget Sound Rivers, University of Washington Press, Seattle, WA. pp. 79-128. Wang, Yi-Chen. 2005. Presettlement land survey records of vegetation: geographic characteristics, quality and modes of analysis. Progress in Physical Geography 29: 568-598. White, C. A., 1991. A history of the rectangular survey system. U. S. GPO, Washington, D. C.
Whitney, G. G. and J. DeCant. 2001. Government Land Office survey and other early land surveys. In D. Egan and E. A. Howell (eds.) The Historical Ecology Handbook, a Restorationist's Guide to Reference Ecosystems. Island Press, Washington, DC. pp. 147-172.